In the first two parts of this series, I gave recommendations on gear and practice technique for the precision rifle beginner. 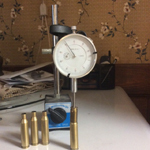 To finish up, I'm going to talk reloading. Let me start off by saying, you don't have to read any further. The teacher is giving you a pass on this one. Precision shooting is a game for the perfectionist. There are guys who will chase every fps from their load and shoot out barrels every other month. But you don't have to do that, and the sport won't survive if that's the only way to play. Some people just want a nice setup shooting reliable factory ammo that lasts for years without needing change. With all the movement on gas gun and production divisions in PRS, I think this fact is well understood. So, what does this have to do with reloading? Well, you don't have to (and shouldn't have to) be a reloader to start enjoying this game. Remember what I said back in part one about just getting out there and shooting? You will need to understand ballistics to make sense of how you're shooting. Plus, odds are you will get sucked into reloading eventually, but it's not mandatory. Once you get started shooting and decide, "Yes! I want more!" now you can spend a little time tweaking your load. You'll be hungry to learn the little intricacies of building properly assembled, long-range ammunition. I didn't set about developing an accurate load before I started shooting precision matches. I simply took a load that fired well from my gun. It delivered sub-MOA accuracy with consistent velocity, and that's all I needed. This isn't a "So, You Want to Try Reloading" series. My intention here is give you the benefit of my experience and point you in the right direction. In this article, I'm going to assume you reload already and understand the basics. No problem if you don't—that's why you get a pass. Just remember to come back to this article down the road. 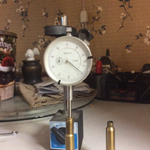 I've included some photos showing some of my reloading process and recommendations, so click on those to see more. And yes, you can enjoy the lovely wallpaper in my loading area for free. Like I said, I started shooting precision matches for some time before I started loading for them. I didn't start reloading until my powder of choice for the 300 Win Mag was discontinued. My old load was serving just fine, but as they say, necessity is the mother of invention. The powder I was using Accurate Arms 3100, and I discovered in 2011 that it was no longer being produced. At about the same time, the barrel on that rifle started producing lackluster groups. So, I re-barreled it with a Krieger 26" SS #17 contour. Old powder no longer available and new barrel installed—what a great time to develop a new load. I used the old ammo to break in the barrel, and it produced very good accuracy. It also chrono'd faster out of the new barrel—significantly faster, in fact. No need to deviate from the old recipe more than necessary. I chose MagPro for my new powder. The data books said 84.4 grains with a 190 SMK should give me almost 3100 fps. Since I was loading ammo much longer than SAAMI spec, I decided to go with 84.5 grains. 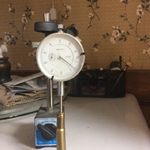 When I shot it across the chrono, it produced in excess of 3300 fps. Wow! No pressure signs, no flattened primers, no shiny spots on the case head, easy bolt lift, and very good accuracy. That range session was fired in 100°+ heat as well, so I decided to not bother trying a different powder. The standard deviation for the load has proven to be very low also. I got lucky with that load. The problem I faced was that many of the matches I like to shoot place a velocity ceiling of 3200 fps. This is to keep from damaging this expensive steel targets. Sooner or later, you will get your ammo chrono'd at a match for this very reason, so plan for it. I'd just purchased several thousand bullets for the gun, so I'm not planning on changing the load anytime soon. When I do, I'll probably try some of the new 200+ grain bullets on the market and hope to get the velocity below 3200 fps. I still needed a gun to shoot that was legal for match use. Ideally, I was hoping to keep costs down for both ammo components and the new gun. I had JP send me an LRP-07 upper in .260 Remington, which was the start of a good relationship with that caliber. .260 is an easy caliber to load for. It doesn't have a sharp shoulder angle or overly large powder capacity for the bore diameter. The .260 LRP-07 proved to be just as reliable as my original LRP in .308. Plus, it came with a heavier and longer barrel that provided more accuracy. If you shoot a gas gun like the LRP, you shouldn't load it as hot as you can a bolt gun. This means you will give up a bit of velocity. This wasn't an issue for me since I prefer to shoot below maximum in all my gas guns anyway. I can push a 142gr SMK at 2590 fps. That keeps me from worrying about transonic velocity issues beyond 1200 yds. The little intricacies of loading ammo for a precision rifle are endless. I do not get silly about sorting bullets and cases due to weight or other means of segregation. I choose quality bullets at the start. Then, I try to use cases that are known for consistency and good performance. The same goes for my powder choice. I use magnum primers primarily because I prefer ball powders or a powder that meters smoothly and consistently through a powder drop measure. Manufacturers almost exclusively recommend hot or magnum primers when loading ball powders—why, I'm not sure. I use a lot of ball-type powders for their easy metering and flow characteristics through powder measures. So, I simplify my inventory by exclusively utilizing magnum primers for all my rifle loading. Quality components gathered, my next step is to set up my loading dies. The goal is to deliver consistent performance without undue stress to cases from working the brass too much. I do this by measuring a fired case from my rifle. I measure case mouth OD and ID to ensure that the bullet is released by the case. The OD tells me how big the chamber mouth is. If the case can't release the bullet completely, then I will need to neck turn the cases. Next, I measure to a point on the shoulder that is a specific distance from the base of the case. The exact point is not important. Just make sure you measure to that point consistently when setting your dies to resize the case for your chamber. After that, I want to size a case and make sure I don't bump the shoulder back more than .002. Doing this means that case life should be good. You're not overly stretching the case when it's fired and then shrinking it back more than it should when you resize it. It may take trial and error to get this right. Once done, you shouldn't have to do this again unless you adjust the dies or use a different press. 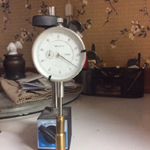 The last thing I measure is overall length from case base to a specific point on the bullet's ogive. I'm not overly concerned with actual OAL, provided it fits and runs in my mags and fits my chamber. Hopefully, your ammo is restricted more by your chamber than by your mags. That way, you can see what works best in your gun, bullet touching lands or slightly off the lands. Once I have the OAL to the ogive measured, I lock down the bullet seating stem on the die and Loctite it in place. 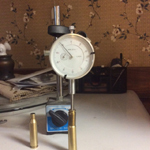 That sets up my loading dies to deliver quality ammo for my rifle. Now, we'll see which loads the rifle actually likes.